A few weeks ago, J and I drove by the Rose Street Market. We both thought it was actually a market and we should check it out sometime. When I got home, I searched Google only to find it wasn’t actually a market but a reception hall. An interesting find though was that there is a deli inside the building. 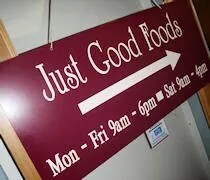 Just Good Foods is on the bottom floor of the Rose Street Market on Rose Street south of Kalamazoo Avenue. When you come in to the building at street level, there are signs pointing you downstairs. There’s an elevator and a set of stairs before you get to the banquet hall which lead right down to where you need to go. The basement level is just that. It’s a wide open space that has been filled with tables on one side and a full service deli and catering operation that takes up the back area. 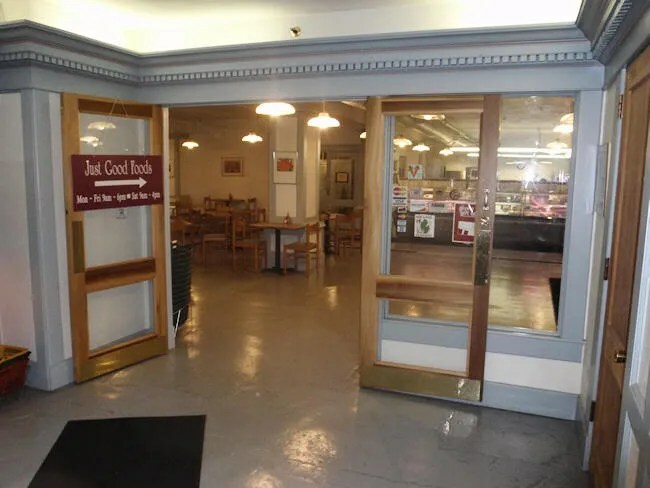 When you walk through the doors, there is a deli case in front of you with a number of salads and other sides. The menu is on little cards on top of the deli case. Each card has a different sandwich or salad selection with an ingredient list. There are no paper menus or one big menu board anywhere in the place. It can be kind of daunting to walk down the whole row reading every card to find what you’re looking for. You place your order at the counter then you are handed a ticket to take to the cash register. On the way to pay, we picked up a couple bottles of pop out of a cooler on the way. After paying, you find a seat and wait for your food to be brought out. Lucky for us, Just Good Food has a free WiFi connection, so, once again, we were that couple who sat on our iPod and iPhone checking e-mail and twitter while we were talking. There was one sandwich that jumped out at me right away from the wide range of choices. I ordered the Blue Moon which organic chicken breasts, lettuce, Dijon mustard and Blue Moon Bleu Cheese. I only went with the half order and I was surprised how big the half order was. The sandwich was served on toasted bread and there were actually two small sandwiches. There was quite a bit of lettuce, so I took about half of it off each sandwich. 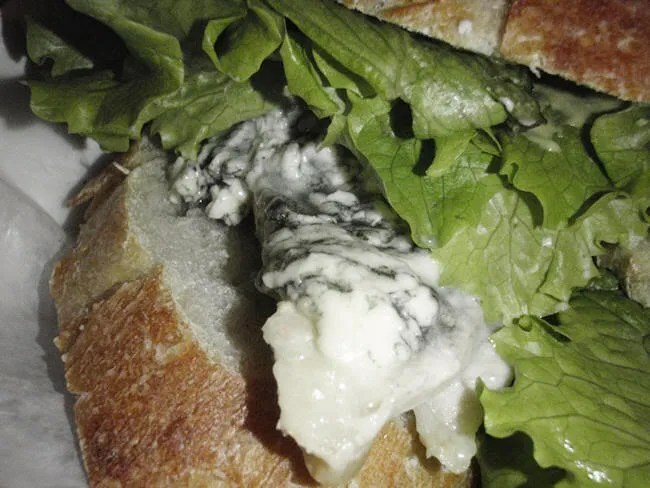 The bleu cheese was delicious. There was quite a big of it on there and it was a real tangy bleu cheese. The chicken was nice and tender. Very delicious. The whole sandwich was a good balance. I was a little worried about the Dijon mustard, but it really went well the cheese. 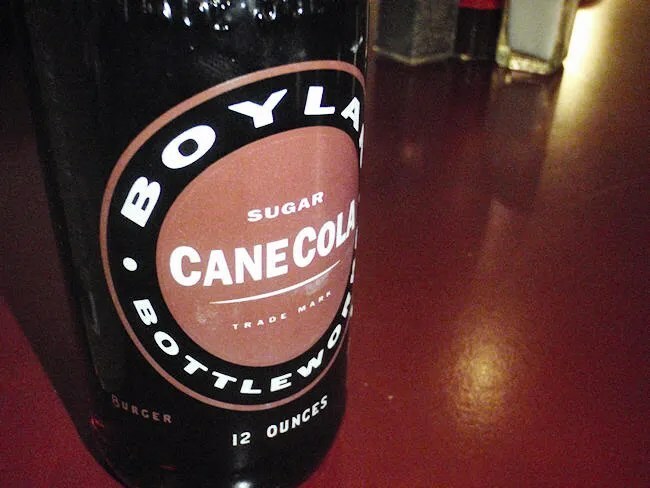 The sandwich came with a little bag of tortilla chips and to wash it all down, I got a bottle of Boylan Bottleworks Sugar Cane Cola. It’s the first time I’ve ever had the soda and it was really good. I had half of it drank in the first swig. I had to slow down to make sure I’d have some for the meal. J went with a soup and a sandwich. She got the Smokey Potato Soup which was a special today and the Just Say Cheese sandwich. 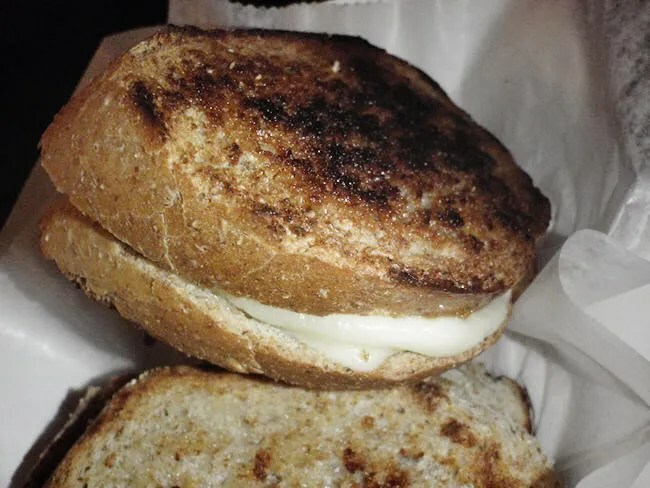 The sandwich is a grilled cheese with a Wisconsin Sharp Cheddar. She really liked the cheese and the bread. She only got the half, but like me, got more than she expected for the half. To say she was a big fan of the sandwich would be an understatement. The soup was a different story. She was expecting a creamy soup, but it was a brothy soup with big chunks of potatoes and dark meat poultry (couldn’t decide if it was chicken or turkey). She didn’t like this at all. I never looked on the menu to see if it listed ingredients she did not like the meat in the soup. 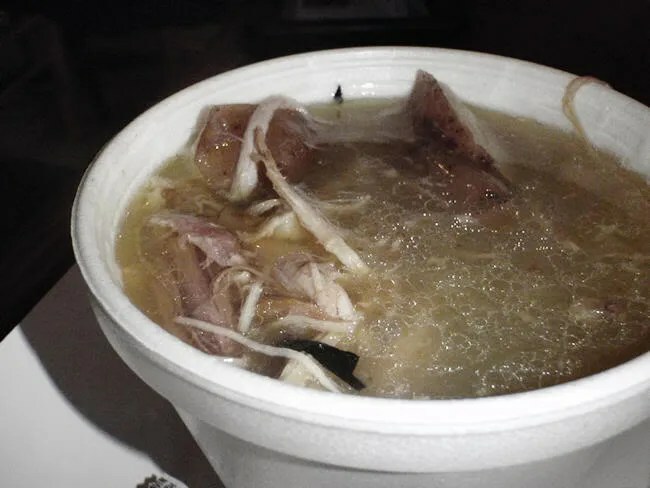 The broth had a very meaty taste and it was really a turn off. I took a few bites and thought it tasted alright, but I’m not a fan of soups. She tried just pulling the potatoes out, but again, they tasted like meat. Our bill was just under twenty bucks. Sandwich wise, we both really liked Just Good Food. J was disappointed in the soup and most of it actually went in the garbage. The atmosphere is a little wierd, but the food more than makes up for it. It’s no secret that you’re in the basement of a building. It’s very open and only sparsely decorated. The food, however, is fantastic. Every ingredient they use is high quality. You pay a little more for it, but I don’t think you’ll leave disappointed. We had our wedding reception at jgf and it was amazing. The food is excellent and their attention to detail is fantastic.